Afghanistan Interior Ministry's Major General Tariq Shah Bahrami has been appointed as the acting Minister of Defense and General Sharif Yaftal as the Army Chief of Staff after officials from the respective posts resigned on Monday. According to Tolo News, Defense Minister Abdullah Habibi and Army Chief of Staff Qadam Shah Shahim resigned from their respective posts following the deadly Taliban attack on Shaheen Army Corps in Balkh province on Friday claimed the lives of over 100 soldiers. The militants were able to penetrate inside northern Afghanistan's largest military installation dressed like the Afghan Army soldiers returning from the front lines, carrying the bodies of wounded comrades. 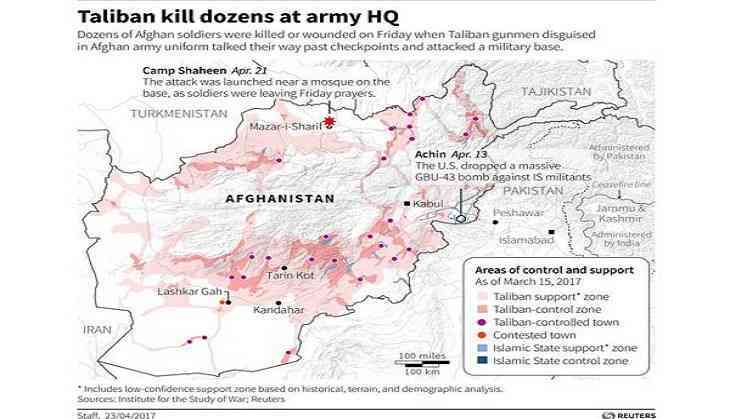 Dressed in military uniforms, a squad of 10 Taliban militants drove in two army Ford Ranger trucks past seven checkpoints and launched a coordinated attack as hundreds, perhaps thousands, of unarmed soldiers were emerging from Friday prayers and preparing for lunch. For the next five hours, the militants went on a rampage, killing at least 140 soldiers and officers in what is emerging as the single deadliest known attack on an Afghan military base in the country's 16-year war.